Having had a nice experience with la roche posay thermal spring water, I decided to try one of their moisturisers meant for combination to oily skin. It's their toleriane fluide. The good thing about this one is that it's fragrance-free, paraben free and preservative free. Bad thing ? It is damn pricey. I read a lot about this moisturiser before buying it and now that I'm using it every day, I'm really liking the feel of this ultra light emulsion/moisturiser on my combination to oily skin (expect a review soon). Now for protecting my skin from the Sun, I am using this highly raved ultra sheer dry touch sunblock (SPF 50+) from Neutrogena. Instead of buying a full size I bought this in 30ml quantity to see if it works for me.The best thing about this sunblock is that it doesn't make skin shiny or oily. Once it's blended well, it doesn't leave a white cast on skin. No wonder why so many people with oily skin like using it. I might buy the full size but I also wanna try sunscreen from other brands as well so I'm just gonna wait until I finish using this up. For keeping my lips soft and supple throughout the day I'm applying natio moisturising lip balm with spf 30 and vitamin e. This lip balm is super moisturising. It doesn't feel heavy or sticky on lips at all. If you suffer from chapped dry lips then you should definitely give this lip balm a try. And finally, the last skincare product that I'm using since past few days is an aloe and cucumber under eye gel pack from natural bath and body. It contains many organic and natural ingredients but it's a little pricey for the given quantity. Though I've used this pack thrice, still I feel few more uses will help me form a better opinion on this pack to share with you all. So that are all the products I'm using in my current skincare routine. There are no scrubs and face masks products because I'm relying on home remedies made from some wonderful kitchen ingredients. What are some of your favourite products in your skincare routine ? Have you tried any of the above products ? I also use Ducray products because my scalp is sensitive and their products are so amazing for lots of scalp conditions. I haven't used any of these products, but I am interested to try out these, as I have the same skin type like yours:) :) Loved reading this post dear. 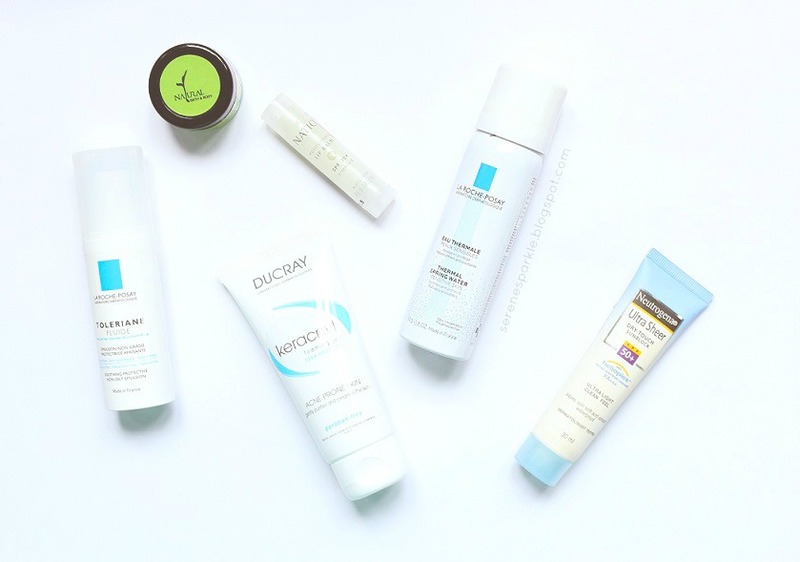 I want to try more la roche posay products after trying thier cleansing gel. Daman pricy yet worth it :D Great products. I have been using Jovees sunscreen daily lately. Loved reading this post. I love the Neutrogena sunscreen. I would like to try the TVAM Aloe Vera Gel. Am currently using the Rustic Art aloe gel. I haven't heard of Ducray products but from your review they seem to be really nice.I tried Vichy Thermal water,it was good but really want yo try out La Roche Posay thermal spring water.Loved all your skincare products.I have been trying a lot of Kiehl's products but haven't seen much difference in my skin as for now. Nice products and out of all these, I use Neutrogena sunblock and it's so good! Hey such good stuff, skin must be thankful. Ducray is on my list of brands to try! I use the same sunblock in SPF 100. The neutrogena sunscreen has been my holy grail for many many years now. I love Ducray keracynl face wash. It is one of the most gentle and effective face wash against acne.